Did I ready that the Rentz House burned down in Graham. Becky and Alex know how to reach me. I’ve not heard anything about it. Such a terrible waste for this house to be in disrepair. It would be nice if someone could fix it up to where it’s at the least —presentable. Do you know where this Rentz House is located? The front door has a large oval glass with beveled edges. On either side is stained glass. Something else that is neat, is the scroll work in the foyer. Also the mantels with beveled edge mirrors. It has large pocket doors connecting the foyer with the living area. I Love this site. Great pictures from my favorite part of my favorite state. Even though I’ve lived in Virginia for over 30 years now, Georgia is still home. I grew up in Glynn County in a little community about 20 miles west of Brunswick, called Thalmann. I hope to come back home after I retire in a couple of years. My mother’s family is mostly in and around Ware county, while my father’s family is from the Appling county/Baxley area. And since our last name is Rentz, this house immediately caught my attention. A different line of the family to be sure since my grandfather was a sharecropper and would have never been able to have afforded anything like this house. But, a part of the same family to be sure. Rentz is not a very common name. I have relatives all over the state, but mostly in South Georgia. There is also a little town in Laurens County called Rentz. I would love to have more history on the house and the town. Keep up this great work that you’re doing. You bring back some great memories for a lot of us. I discovered this house a couple of months ago, while on a road trip. It is in need of much repair. It is called the Rentz House, it was thier family home. They also, had a cafe in Hazlehurst, Ga. (The White Kitchen Cafe). I wish you could have gotten a closeup of the front door and the surrounding yard, maybe if you are through that area again you can. Thanks for the GREAT work you have done, your photos are excellent!!! P.S. Your Long County collection is awesome! I am from that area. Thanks for the information, Becky. I’m glad you like the Long County photos. I spend a bit of time there myself. I have always been inerested in the past and especially my GA roots. 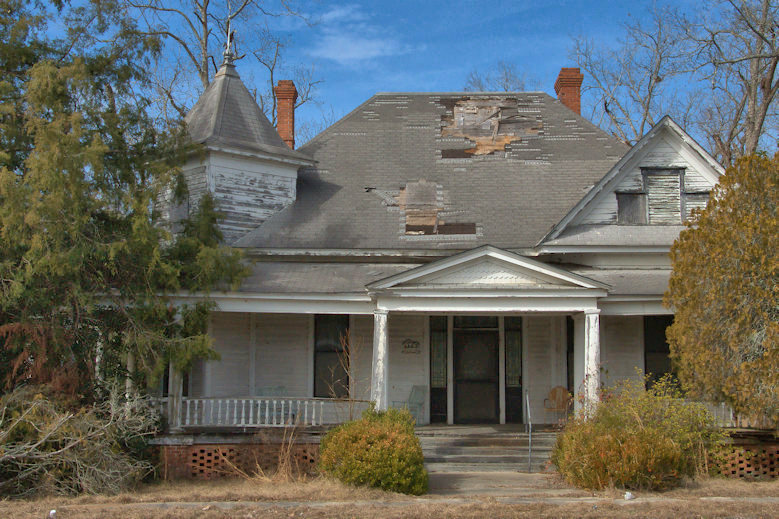 I have an article and picture of my greatgrandfather’s house in Ben Hill county. I would be happy to e-mail a copy to you. I spent my summers and most weekends at my grandfather’s farm. Unfortunately, the place burned a couple of years ago. I have that picture and story, too. Very interesting connection to Ben Hill County, Annie! Thanks again for sharing, and for visiting VSG!